Dr. James Courey is an expert in the restoration and replacement of teeth using implants, crowns, bridges, veneers and dentures. The American College of Prosthodontists states, "Extensive training and experience provide prosthodontists with a special understanding of the dynamics of a smile, the preservation of a healthy mouth and creation of tooth replacements." Missing or imperfect teeth due to trauma, decay or diseases can be replaced with beautiful, long-lasting, functional teeth. 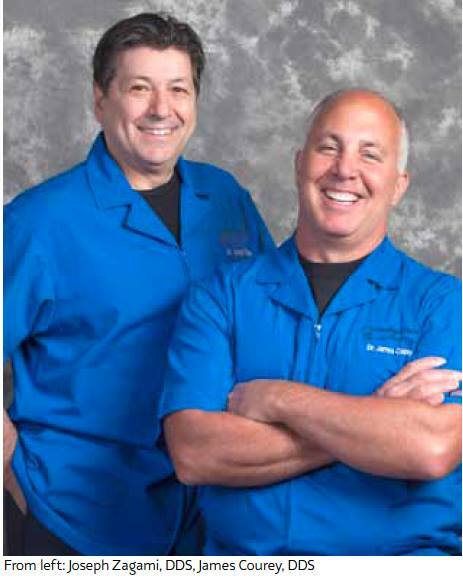 "A great team is the key to providing our patients with the best restorations available," says Dr. Courey, who practices with prosthodontist Dr. Joseph Zagami. "Our collaboration with the finest dental specialists and labs leads to innovation in solving the most complicated dental dilemmas." A graduate of University of Iowa College of Dentistry, Dr. Courey completed his prosthodontic training at Albert Einstein College of Medicine/Montefiore Medical Center and four years of advanced implant training at NYU. "Ongoing study of a variety of medical, dental and surgical disciplines gives me a wide range of diagnostic insight and diversified approaches to tooth replacement solutions," he says. Dr. Courey is a postgraduate instructor of implant and restorative dentistry at Columbia University College of Dental Medicine. He has seven consecutive New Jersey Monthly Top Dentist honors.